President Rodrigo Duterte has stated that martial law on Mindanao could be expanded across the whole Philippines if the threat of the terrorist Islamic State (ISIS) persists. Last Tuesday, the President imposed martial law on the whole Mindanao Island after a clash between Muslim separatists and other rebels clash with the Philippine Army. These groups are known to be in alliance with the terrorist group ISIS. Citizens of Marawi had no choice but to flee the city. "I will not hesitate to do anything and everything to protect and preserve the Filipino nation," the president said. 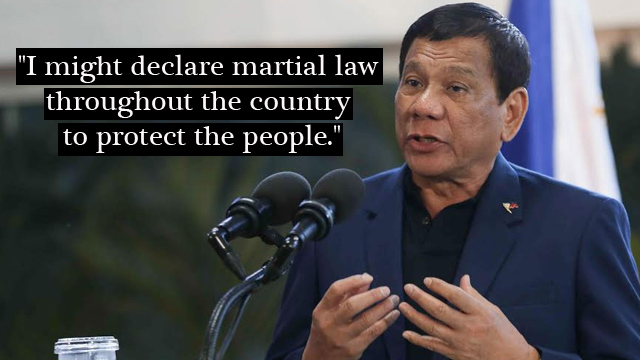 "I might declare martial law throughout the country to protect the people." Duterte guaranteed he would be harsh in dealing with terrorism as he imposed 60 days of martial law on the land. The iron-fist president had to cut short his state visit in Moscow with Russian President Vladimir Putin when the news of the rebel group take over broke out. The martial law can be imposed by the head of state for only sixty days. Duterte further added that if it takes a year to get rid of terrorism in the country, he would gladly do so. On previous occasions, the former Davao City Mayor has frequently raised the prospect of martial law amid outbursts of violence in Southern Philippines. Under the martial law, the writ of habeas corpus or the protection of citizens under unlawful arrest is suspended in Mindanao. However, the president assured the public that it doesn’t target law-abiding citizens and law enforcers will not abuse their powers. The Philippines had experienced years of human rights abuse under the martial law imposed by the late president Ferdinand Marcos. “We’re the least of your worries,” Duterte said in his speech. According to Defense Secretary Delfin Lorenzana, the government would probably set up checkpoints and impose curfews in the said regions.